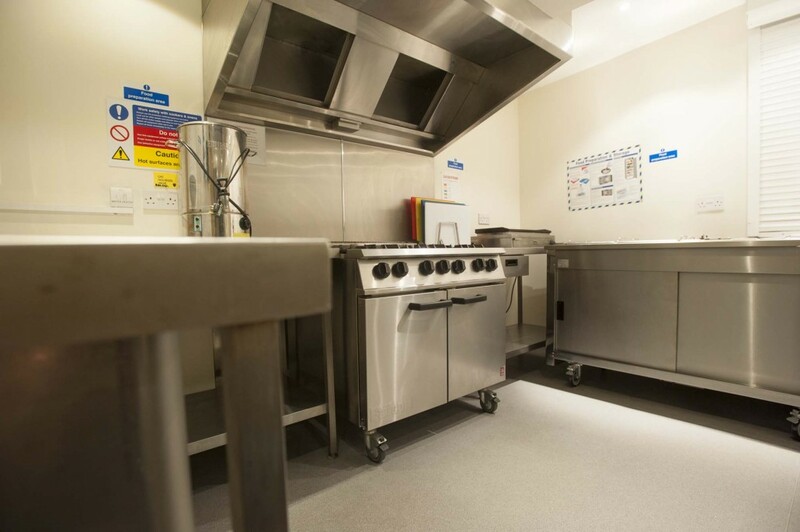 Take advantage of our facilities & rooms for hire! Browse the gallery & information below to see rooms on offer, review our room rates & conditions for hire & send an enquiry to check availability. 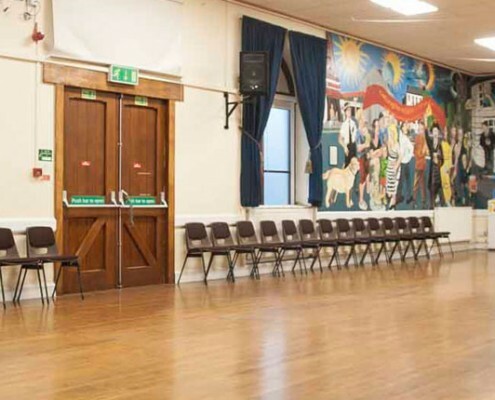 The Town Hall is available for hire for a variety of commercial and social events. It can be hired for meetings, dances, birthday parties, wedding receptions, exhibitions, concerts, anniversary celebrations, exercise classes and fairs. There is a stage (depth 2.43 meters or extended to 4.26 meters), music and lighting systems and LCD projector and screen. It has a maximum seating capacity of 180 theatre style, 112 cabaret style on oblong tables and 120 cabaret style on round tables. It has a maximum standing capacity of 225. It can comfortably hold 25 tables for a fair. It has full disabled access and wifi. 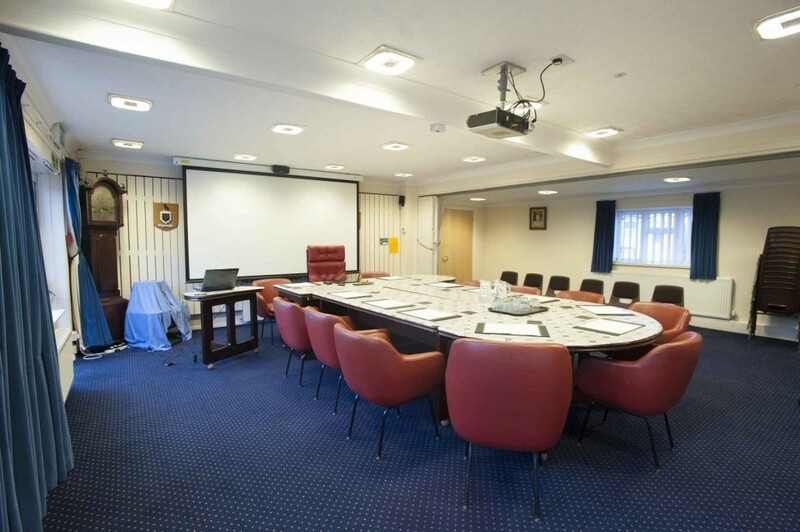 The Council Chamber is the perfect place for a formal meeting or a smaller function. 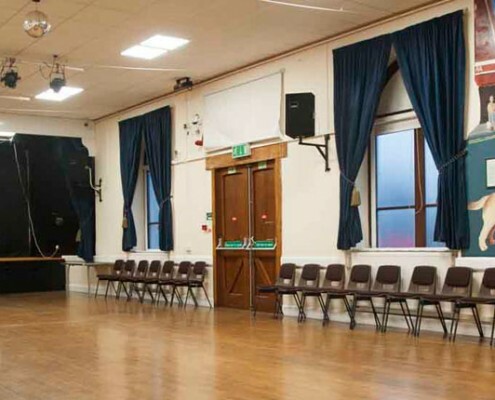 It has a maximum capacity of 50 theatre style, 30 boardroom style and 12/18 classroom style. It has a maximum standing capacity of 60. It has full disabled access and wifi. A LCD projector and screen are available along with TV/DVD player. 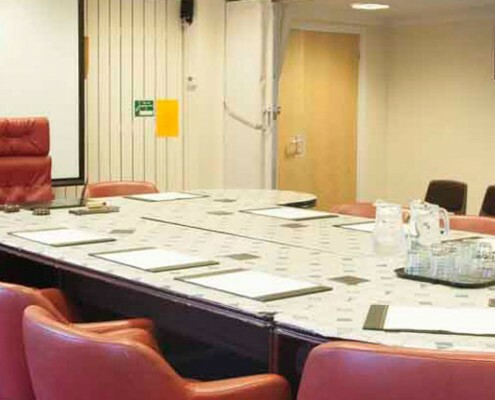 The Committee Room is a small formal meeting room excellent for meetings, interviews, craft making sessions etc. 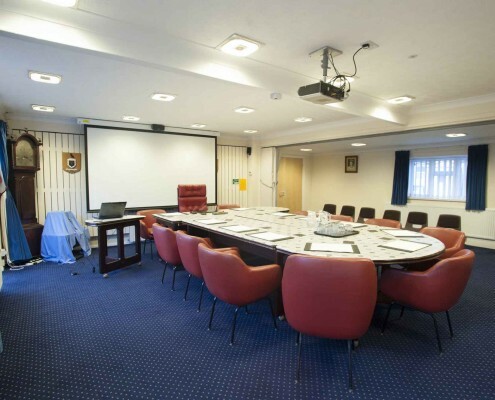 It has a maximum capacity of 20 theatre style, 12 boardroom style and 8 classroom style. 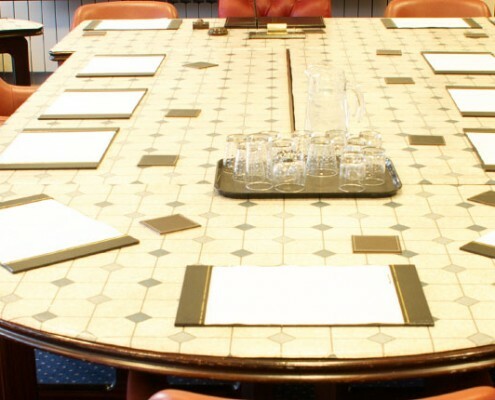 The Lounge Bar is an informal area which can be used as a meeting place prior to an event in The Town Hall, Council Chamber and Committee Room or it can be opened up and used with the Committee Room to create a larger space. There is also provision for running a bar when booked with the kitchen. It has a maximum seating capacity of 40 theatre style. 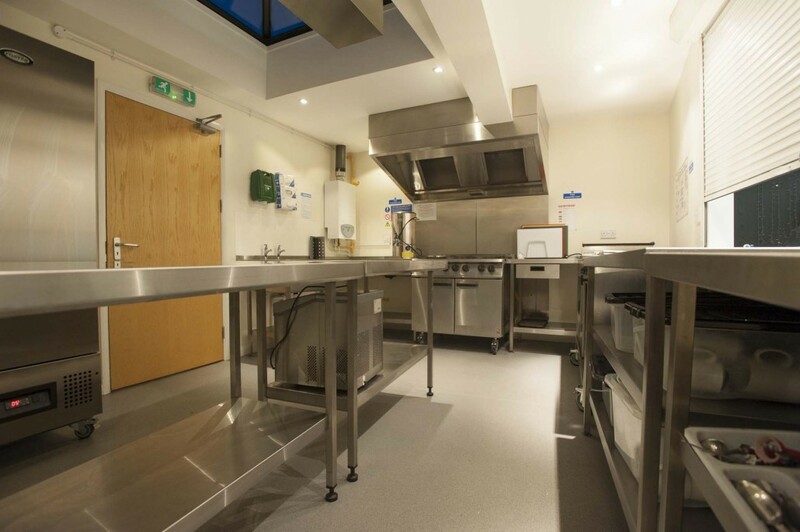 Our fully equipped modern kitchen can be hired for light use (teas/coffees) or heavy use for the full preparation of buffets, lunches, dinners etc. 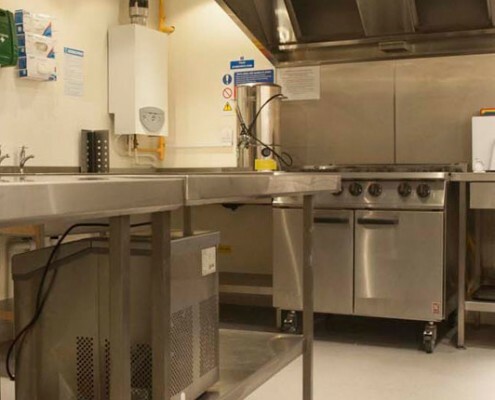 It consists of a large commercial oven and grill, bain marie, microwave, double fridge, hot water dispenser, commercial dishwasher and crockery and cutlery for up to 120 persons. To enquire about the availability of the Town Hall and other rooms, please complete and submit the details below. We will endeavour to answer your enquiry as soon as possible. • Hire of Round Tables/blue chairs £15.00 per hire. • Anyone holding a bar within the complex must remove all empty bottles from the premises, the council cannot dispose of these. Anyone leaving glass bottles behind will be charged for disposal. For the purpose of these conditions the terms ‘hirer’, ‘you’ or ‘your’ mean an individual hirer or the authorised representative of an organisation. 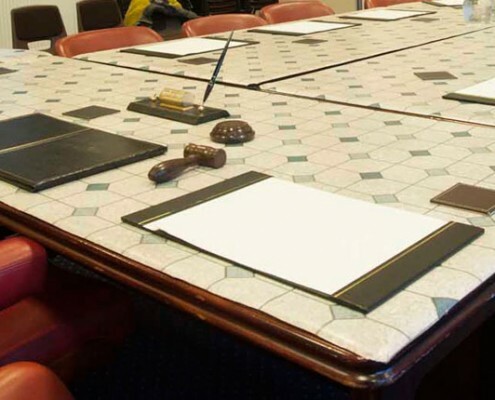 The terms ‘we’ or ‘Council’ mean Callington Town Council. The term ‘event’ means the function specified in the Agreement. Hirers are advised to view the facilities in advance of booking. * Fees are reviewed annually and are currently charged per hour. The premises are not available for hire between the hours of 0100 and 0700. You must keep to the period of hire specified on the application form. You will indemnify the Town Council against any claim, loss or costs arising from your failure to vacate the premises at the agreed time. Deposit – A non-refundable deposit of 50% of the total fee due is required before a reservation can be confirmed. Prior to receipt of that deposit, reservations are provisionally agreed but can be re-let if the completed application form and deposit have not been received within 14 days of the provisional booking. Any regular user/Account holder will be invoiced after the event and will not need to pay a deposit. Balance. We will invoice you for the balance which is due 14 days prior to your event. 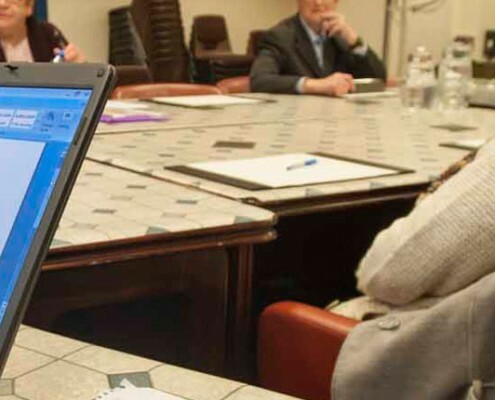 We reserve the right to cancel the agreement for hiring at any time if the premises are needed for purposes of national or local importance not contemplated at the time of hiring or if the hiring is not deemed to be in the best interest of the Town Council. Our decision to cancel will be final, and fee paid will be returned to you and you agree to accept it in full settlement of all claims, costs, losses and damages that you might otherwise have against us arising from the cancellation. In the event of you cancelling a booking or if you fail to attend your booking, the following cancellation charges will apply. Where it is necessary for staff to work additional hours to prepare for your event, or to clear up afterwards, you may be invoiced for the costs involved. Where consent is given for assignment or sub-letting the event organiser will be charged the standard fee for all the accommodation used and it will be their responsibility to collect any other monies from any other parties involved. We reserve the right to charge a damage deposit in addition to other fees, which would be refunded after the event if the conditions of hire are complied with. These conditions apply to all users of the accommodation whether for public entertainment purposes or not. If you do not keep to these conditions you will have to indemnify us against any loss, fine or expense arising. You must not drive any nails, tacks, drawing pins, screws or similar into the walls, doors, floors, woodwork or any part of the structure, nor use any adhesive or adhesive tape to fit items to floors or walls. 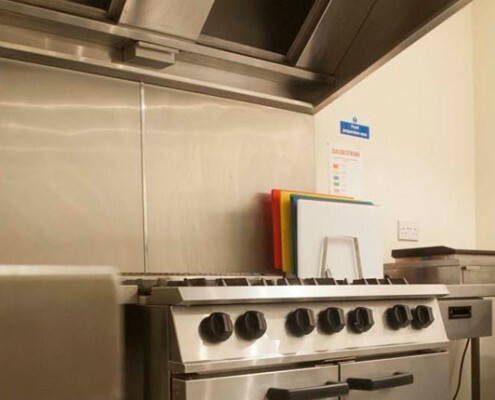 You must take every care not to damage the decoration and must pay the cost of making good any damage caused to the building, its fixtures and fittings arising out of your use of the premises. You must keep every designated exit route free at all times from obstruction. All entry and exit doors must be unlocked while the public is in the premises. You must not conceal or obstruct access to any fire fighting equipment. The hirer is responsible for the orderly evacuation of the building in the event of an emergency, and for ensuring stewards are familiar with emergency procedures. The hirer should contact the Caretaker prior to the event to be shown the position of emergency exits and fire extinguishers. Fly Posting in connection with any hiring is prohibited and if undertaken could result in refusal of future reservations. Should areas need to be cleaned as a result of fly posting the organisers will be invoiced for that service. No Portable heaters (electric, LPG, paraffin or any other fuel) are to be brought into the Town Hall. Any electrical appliances brought in by the Hirer must have a current PAT test certificate. You must maintain good order and decent behaviour by persons attending your event. Events must be conducted decently, soberly and in an orderly manner to ensure the safety of the public, performers and staff. We reserve the right to employ door supervisors (normally Town Council Staff) for any reservation, the cost will be passed to you. You must ensure that noise does not come from the premises which cause a nuisance or disturbance to people in the neighbourhood. You and your stewards must ensure that people leave the premises in an orderly manner. We reserve the right to refuse entry of anything or any object to the premises. Temporary electrical installations may only be installed with our prior approval in accordance with the Institute of Electrical Engineers regulations. The temporary electrical installations must be cut off from the permanent installations immediately after each occasion on which they are used. The must be entirely removed as soon as the need for them has finished. We reserve the right to have electrical items inspected prior to use and any costs will be paid for by you. Cetain goods must not be sold on the premises without our consent. All the Council owned premises are no smoking and smoking is not allowed anywhere inside any Council building. 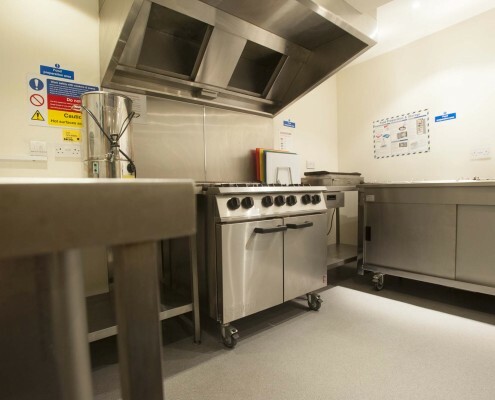 Any spillage must be cleared immediately to prevent damage to the floor and injury to people. Portable coat stands are provided free of charge if requested when making the booking. They will not be in a secure area and items are left at the owner’s risk. Vehicles may use the pannier market for unloading and loading, but once this is completed they need to be removed to the large County Council owned car park or the Town Council Free Car Park by Saltash Road Park. Everything belonging to you or brought in by you must be removed at the end of the hiring, unless previously agreed with the Town Clerk. There may be a storage charge for items left without permission. All items brought into the town hall or left after the event are at the organisers/owners risk. You will be responsible for leaving the building in a reasonably clean and tidy conditions and for replacing any items moved from their normal position. You or some responsible person aged 18 or over whom you nominate in writing must always be present with the public are on the premises. The person in charge must not be engaged in duties which prevent them from exercising general supervision of the hiring arrangements. Whenever members of the public are on the premises the competent adult stewards must be present, all stewards must be easily identifiable. Public Liability Insurance cover is required for a minimum of £5m for any professional event. 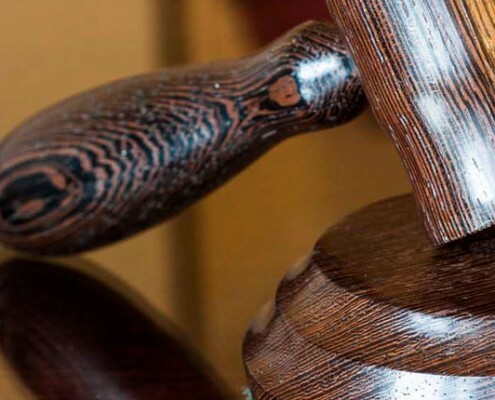 The hirer shall indemnify the council in full respect of all damage or injury to property or person and in full against liabilities, claims, demands, losses, damages, costs and expenses suffered and incurred by the council as a result of or arising in connection with an event. If you do not hold insurance we can add you to our policy for a nominal charge. 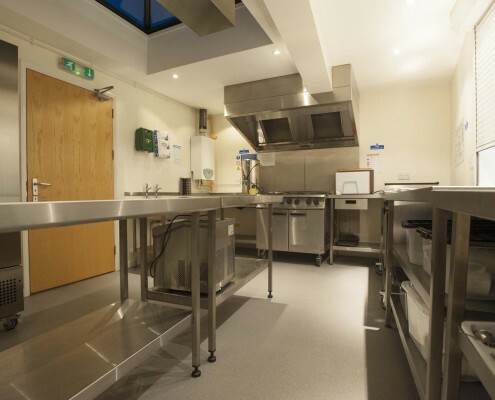 A fully fitted commercial kitchen is available, you must ensure that everyone preparing or serving food complies with all relevant Food Hygiene legislation. For further details on the Town Council’s existing general licensing provisions, please contact the booking clerk in the first instance. Hirer’s wishing to sell alcohol will need to discuss the matter with the Bookings Clerk. No persons under the age of 18 are permitted to consume alcohol on the premises or to be intoxicated on the premises. Challenge 25 must be operated on the premises (anyone who looks under 25 should be asked for proof of age). Callington Town Council Staff have the right to challenge any person to provide proof of age and require them to leave if they consider them to be under 18 and have consumed alcohol. Callington Town Council Staff have the right to require anyone who they consider to be intoxicated to leave the premises. Callington Town Council has the right to stop an event or require any persons to leave the premises if they consider that the event or persons to be out of control or if the event or persons presents a risk to the premises, the public or the good name of the Council.